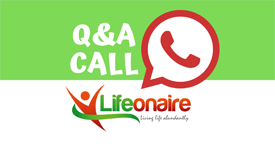 Gather online Friday at noon for a conference call with Lifeonaire's Jason Wojo and KREIA President Eric George. Jason Wojo of Lifeonaire and KREIA President Eric George are hosting a free conference call on Friday, February 1. Point your browser to this website on Friday at noon to join in! The webinar is a follow-up to last week's full-house KREIA meeting on how to make more money while enjoying all the time you need to spend with family and do the things you love. Find out more about how Eric is using Lifeonaire techniques in his own life -- and how they enabled his wife, Christina, to be able to quit her day job. And learn more about the 3-day event Lifeonaire will be holding in Louisville February 21 - 23. Get your questions ready, and see you on the webinar!